Happy Feast of St. Margaret of Antioch, virgin, martyr, dragon-slayer. 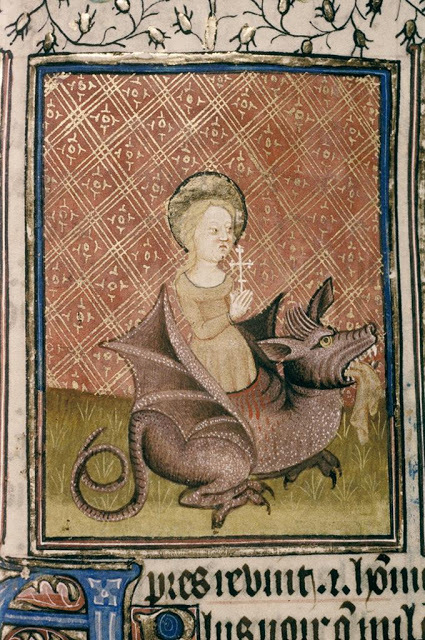 And YOU thought St. George got to have all the dragon-related fun! Whenever anyone says the Catholic Church wants to subjugate women, I want to make them read The Golden Legend. Because, sure, SOME religions DO want to subjugate women. But ours super-duper does not. The Golden Legend is a collection of hundreds of hagiographies (I  that there is a special word just for “biography of a saint”) first compiled in 1260 by Blessed Jacobus da Varagine, Italian Archbishop. It was the second most widely read text of the middle ages, after only the Bible, and nearly a thousand old copies of it are still in existence. It’s where all the craziest (slash AWESOMEST) saint stories come from, and the good archbishop does take care to remind us that the more fanciful parts are almost certainly apocryphal. These are the stories that were told again and again for generations to Catholic children and adults. These are the lives that were held up as examples of heroic faith and virtue. And you would be AMAZED at the variety. There are meek saints and mouthy saints, rich saints and poor saints, skinny hermit saints and (literally) giant saints. The women of The Golden Legend stand up to their fathers, and to kings and emperors. They endure tortures just as grueling as the boys’, and they’re just as tough doing it. St. Katherine of Alexandria faces down the pagan emperor’s wisest advisors in a debate beat-down that ends with the advisors professing their faith in Jesus Christ and being martyred on the spot. Then, while imprisoned in the palace dungeon, two hundred members of the royal court come to visit her and are converted, including the emperor’s own wife. That’s some sound apologetics right there. Whether these legends are exactly historically accurate (fingers-crossed) or are just meant to be inspirational, what they show us is that the Catholic Church has always celebrated the virtues of all kinds of people and all kinds of saints, and that includes all kinds of women. 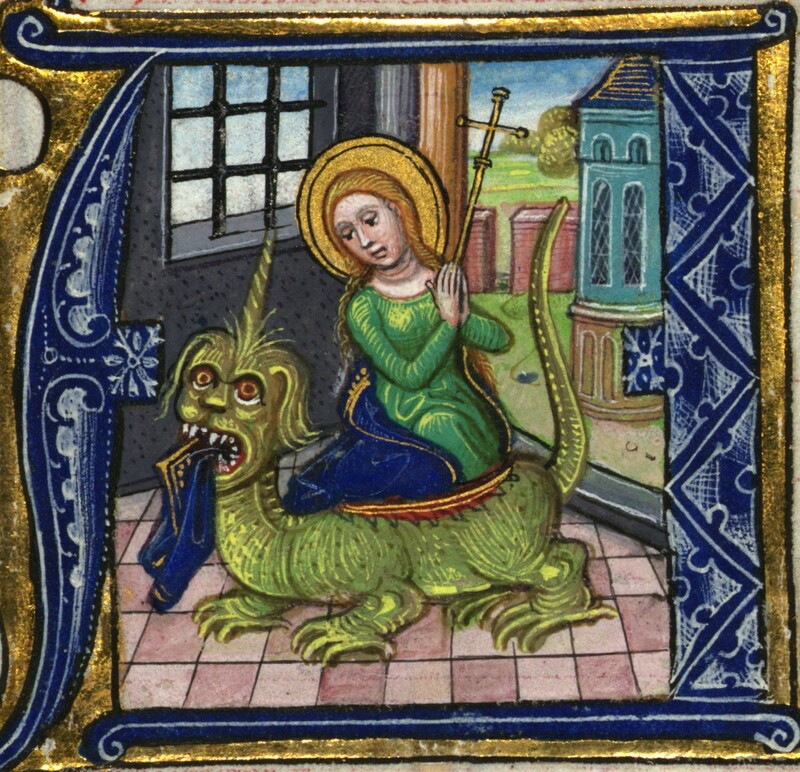 St. George may have saved the princess of Silene from a dragon, but St. Margaret of Antioch saved herself, thank you very much. The legend goes that Margaret was taught the Christian faith in secret by her nurse. 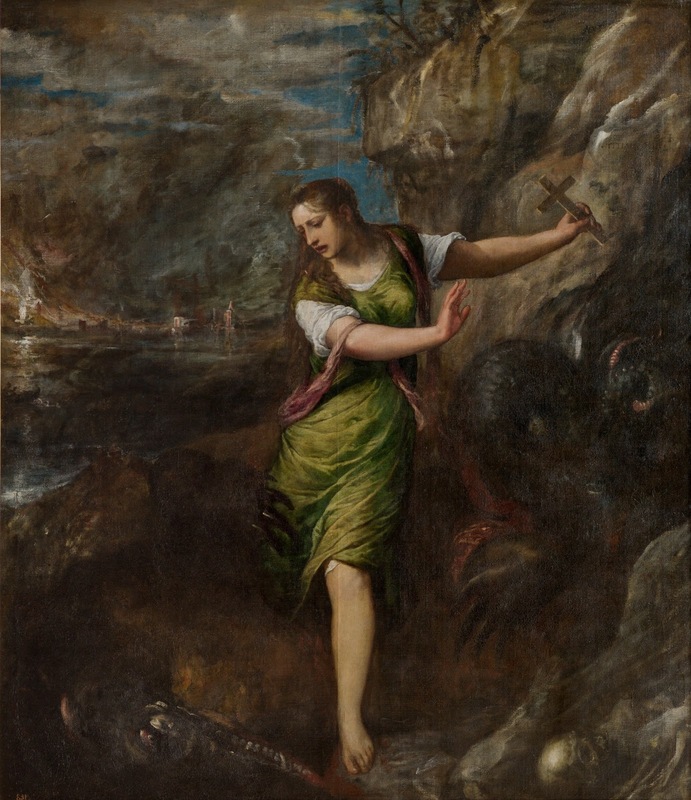 When she was fifteen years old, the provost of Antioch saw her walking along the road. He was struck by her beauty and decided to make her the kind offer of allowing her to become his concubine. When she declined, he had her arrested and thrown into prison. Again and again she was offered the choice between worshiping the pagan gods of the provost and living as his concubine in luxury, or enduring torture and privation in prison. Again and again, she held fast to her faith and principles. One day, Satan himself came to tempt her. 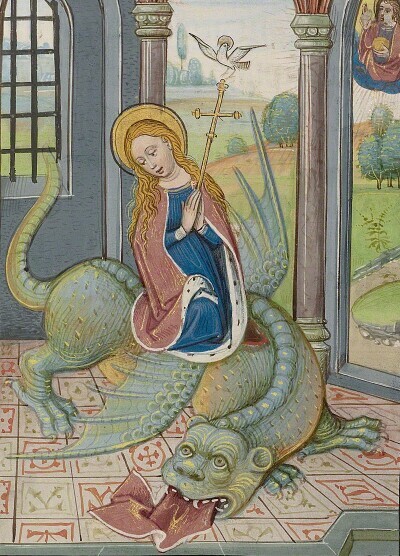 Margaret kneels down in prayer after her victory, but then Satan appears to her again, this time as a man. When he again attempts to tempt her with his lies, she rises from prayer, grabs him by the neck, and full-on-WWE body-slams him to the ground. Then taunts him for getting whupped by a girl. So then, finally, eventually, she receives the crown of a martyr at the hands of the provost. 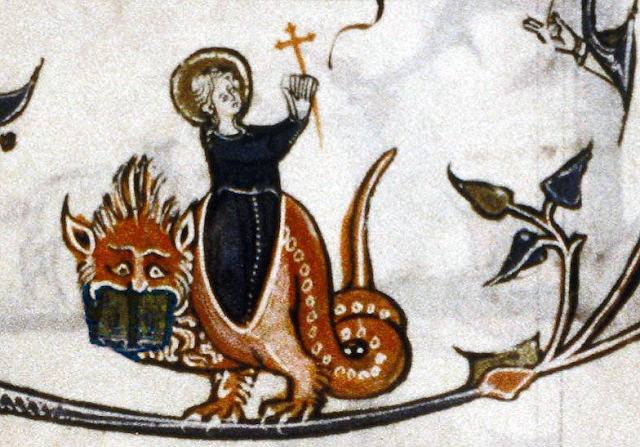 So, if you’re worried that you’re not exactly cut out for the gentle and quiet path to heaven, know that there’s also one where you get to fight a dragon and then execute a piledriver on the devil. St. Margaret of Antioch isn’t one of the feast days I put in the upcoming book, and it’s not one we have a special family observance for, but writing this up HAS given me a bit of a hankering for dragon rolls . . .
You can read the whole legend of St. Margaret of Antioch here. And St. Katherine of Alexandria here. And St. Christoper (the giant) here. Or just get the (abridged) book version here. Can I just say I'm real glad you're back in the blogosphere? I second that! 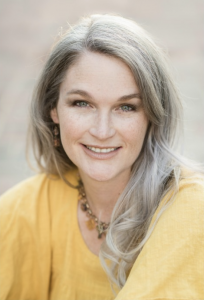 So glad you're back to blogging and sharing the delights of how your family lives out the faith! It looks like The Golden Legend is a series of volumes, do you recommend owning the individual volumes or the abridged version that is linked for family life/reading? Thanks Rebecca! I can't actually personally vouch for any of them. I've only read them online, so I'm not sure what the translations are like in the book versions. The online versions are hard for my kids to understand, so I just read them myself and retell them in my own words. If anyone gets/has the print version I'd love to hear how readable it is!